With the Album list below you can listen to and download low quality mp3's of the songs/tunes. You can have the songs for free or you can make a donation if you do this. Think of it as if I am "BUSKING THE NET'. You can throw a coin by making a donation on Pay Pal. have many more songs and tunes to record and your donations will encourage me to get that done. You can also email me for a CD of the music you want and I'll snailmail it to you on receipt of 20AUD per CD(Pay Pal donation). Here is the information about the albums I have recorded. These albums are all available from me on CD. I have put some songs on efolkmusic.com. If you are into folk please look at this great site. Our Albums in the order they were recorded. by Andy Priest. Recorded directly to two track digital. students there. If anyone remembers hearing it then I'd love to hear from them. 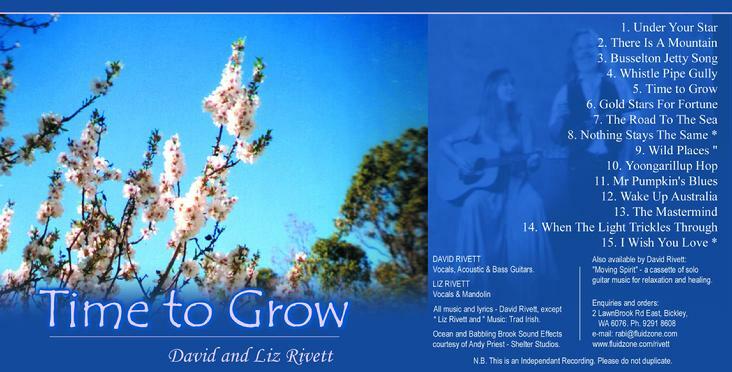 Time to Grow: Our first album of original songs includes two by Liz "I wish you love" and "Nothing stays the same". recorder and mixed it to a DAT tape. Mark Whitehouse at Pro Copy in Perth re mastered it for me. Part two, Heart Songs ,is often used for groups to chant with if they don't have a musician to lead them. Her Winding Path; an album much loved by my pagan friends. Moon Lady. To sing at full moon. I am coming home. For when we are in present time. Ocean of Love. Lets all drown in the Ocean of Love. Love is something we can trust. Sung to me by a winged nature spirit in a special place near my home in the hills. Moon Lady. A version for chanting. Wings of an Eagle. We all need meaningfull goals. No Other Land On Earth; The Pioneers classics album with some originals. Here are some traditional songs and three original tunes from the album "No other land on earth"
Come by the hills. Liz sings a traditional Irish song adapted for our audience in the Perth hills at the Mundaring Weir Hotel. With my swag on my shoulder. My favourite bush band classic. Ten thousand miles away. Another bush band classic. No Other Land On Earth; an original song celebrating WA. Yoongarillup Hop. with Eric on fiddle..
Born in the country. Oh the life of a country boy! 5. Wide Open Spaces; the second album with Eric. All my songs written between 2005 and 2006. I mixed the songs and mastered the album. All people together in one land. EWritten especially for an Oz Day concerrt at the Perth Entertainment center with the theme of reconciliation.. Heading up north. When it's cold and wintry in Perth we head north for the sun. Coral Bay. I was working as a campfire musician and support for a group of people struggling with life's challenges on a journey of adventure therapy. Faraway. The road north to Port Hedland and on to Broome. Karigini Walkabout. Don't get lost in Karigini. I heard the land. The Pilbara is awesome country. Water for Kalgoorlie. A tribute to C Y O'Connor. Wide open spaces. I love the wide open spaces of Western Australia. I will upload previews of both soon or you can email me for copies. Just About Time is a new album of songs. 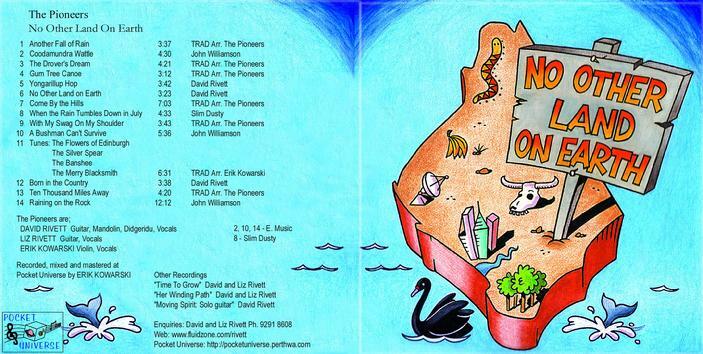 These songs are a bit more personal and move away from the Australiana theme of our last two albums. When we play live I use a looper so what you hear is what we can play live. Liz plays guitar on some songs when we play live and of course she does the harmony vocals. Here are some mp3's of the recordings also available on CD from me. Just about time. Of all the things in this world we need there is something we need more than ever and that is more love. Hills of Karigini. A moment in time reflecting the beauty of Western Australia's Karigini National Park and my own true love. Time enough for heaven. liz's father used to say "You're never in heaven' whenever anyone moaned about anything. Mother Earth please forgive us. People don't change until they are uncomfortable..by then it might be too late. Love will come again. A song of healing. Why should I moan, A song of contentment. Time is rolling by. What have you done with your life. City Farm. A biodynamic farm in the heart of East Perth. Black Guitar. A black arch top guitar made for me by Rad Brashaw in Fremantle. Arab Spring. Spring or is it winter? Who knows where our music comes from. Funky Turnip. Black guitar again...something from the farm.